Paul has finished three IMs so far – and his slowest was an 8:05 in his first race in Melbourne 2012. He also DNF’d in Kona that year. He had another great race in Melbourne 2014 where he finished second which gave him enough points to qualify. 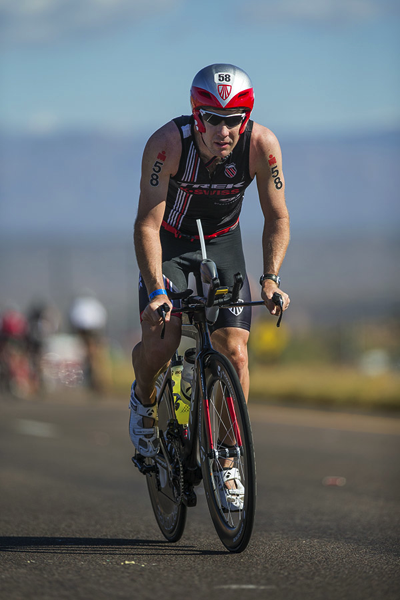 Will he be able to deliver a Kona performance on the same level as his previous results? It’s impossible to tell from the data – so it was great to have a long chat with Paul about his development and his perspective on this year’s race. Thorsten: Looking at your results, the first Ironman race that I see for you was 2012. What was your background coming into the sport? Paul: I came through the Australian junior ranks. I raced Luke McKenzie at the Junior Olympics in Australia in Penrith back in 2001. Luke won and I came 3rd. I think Emma Snowsill won the Girls’. Annabel Luxford was there. So I’ve been around the sport a long time. I did a few World Cups when I was younger. Then I went to Brett Sutton for three years. Sutto actually wanted me to do an Ironman back in 2005, and he pushed me to do the UK 70.3 in 2005. Three or four weeks before that, we’re driving home from a little race in Switzerland that I had won. He just said to me, “I’ve got a race for you that I think you’d do well at, it’s a Half Ironman over in the UK. You’re going to do it. I think you’ll go well. Just eat Mars bars on the bike and it will be sweet.” I was living with Reinaldo Colucci at that time. Reinaldo was going to do the race as well and he’d already done an Ironman and few Halfs. So every day for three weeks it was Ronaldo versus Barney, every single session. I ended up beating Ronaldo in the race and I ended up winning it. Sutto thought I’d be good at Ironman. At that time, I was just, “No, I’m not going to ride and run that long.” But looking back and seeing what I’ve been doing now, I think it probably was the right distance. It just took me a few extra years to sort it out and finally do one. T: If Sutto wanted you to do an Ironman in 2005, why did it take you until 2012? P: I don’t know. In 2007 I started coming to Boulder because I just needed a change. In 2007-2008 I trained with Crowie and he said, “Once you start to go long, you’ll loose your speed and you can’t really go back.” I was very cognitive over that. I’ve been doing 2-hour runs and 2-and-a-half-hour runs with Sutto since 2003. Crowie said, “Your body will be fine. It’s in the head that Ironman is hard.” So it took me a while but eventually I decided it was time to have a crack. T: You had a great start to your IM career in 2012 with Melbourne, you qualified for Kona, but then Kona didn’t go too well. P: Melbourne was a cool race and everything just went so easy. Then I turned up to Kona a little naïve and I little wet behind the ears. I trained really hard for that race. I was super fit. But when you’ve got 50 of the fittest guys in the world, everyone is just going hammer and I just wasn’t ready. In Melbourne, there were maybe 10 guys that were fit. In Kona, there are 50 guys that are fit. I missed my bottle at Hawi, the heat, a lot of little things just added up. I’ve got out onto the Queen K on the run and I said to myself if I keep going and I finish, then my season is over. Or I could pull out, go to Arizona and make some money. I sat on the side of the road for about 15 minutes contemplating what I was going to do. I talked to Crowie the day after the race, he said, “No, that was a smart decision you made. You’ve got to make money. This is your job.” At that time, it was a hard decision but, in retrospect, it was the right one. T: You recovered well and finished second in Arizona, but still didn’t race any more Ironman races in 2013. T: How did your relationship with Crowie start? P: I’ve known Crowie since 2001. That was the first year I went to World Champs in Edmonton as a Junior and he was in the Senior team at that time. That was the first time I met him and then I raced him in Australia. Then in 2007-2008 when I came to Boulder, I was with Stephen Hackett. We did a lot of training with Crowie. The place I was staying at didn’t have any TV or internet. So every second day, I was at Crowie’s place, watching ESPN and stealing his internet. Neri [Crowie’s wife] would cook me dinner every second night. They’d go out for dinner and I’d babysit Lucy [Crowie’s oldest daughter]. Ever since then, we’ve been pretty tight. He’s won Kona three times, he’s got the course record. There’s no better guy that I would want to work with. He’s very old school and I’m still very old school with the way Sutto taught me. So it works pretty well. T: What does being coached by Crowie mean exactly? Does he write your training plans? P: He writes my programs, he does everything. So November, December, January, leading up to Melbourne, with him being in Australia and me being over here, he wrote a program for three to four weeks. I just do it, just did it every day. I’d send him an email once every two or three days, telling him how it’s going, and we’d Skype once a week, once a fortnight. This summer, it’s been quite cool because he was in Boulder as well. Every night the last 2 months, we’ve talked. Hillary [Paul’s wife] works for NormaTec, and she’s away a lot. So I’d always be over at Crowie, and Neri still cooks dinner for me. Neri went home a few weeks ago so Crowie has been over to our place to return the favor. The last eight weeks, we talked every night. We’ve done a lot of riding together. We meant to do a long ride tomorrow. “How are you feeling?” I said I’m tired. He said, “Okay, easy day tomorrow. We’ll go on a long ride the next day.” We’ve just changed. Leading into Kona has been very specific in terms of what we do, when we do it. He’s just tapping away in my head, telling me what I need to do in Kona to do well. Every day, he’s just drilling it into me, so I know it by heart now. I’ve certainly learned a lot. It’s not every day you have your coach actually doing the 6-hour ride with you. T: But then he’s not just your coach. He wants to go for Kona this year too, right? P: I’d love to win and I’d love Crowie to come 2nd. In an ideal world, that would be perfect. In Melbourne, we got to the 45k turnaround bike and someone asked, “What was it like seeing Crowie, good friend, your coach, in the second group?” I said, “It was awesome. When the gong goes, I hate the guy. I want to beat him. Seeing 3-time World Champion in the second group was awesome. I still want to beat him.“ I can tell he gets fitter every week. To be honest, we’ve done a lot of rides together but I think I’ve run with him maybe twice in the last two months. He doesn’t like doing the speed stuff anymore. T: Based on your previous results (all of them really fast, 8:05, 8:04, 8:02), I have no idea how you’re going to do in Kona. What are your own expectations for the race? P: I’ve done a lot of riding with Chris Leigh and we’ve joked that if I’m not going to go under 8:05, I was going to pull out. We’ve prepared my body. It’s going to be hard, it’s going to be windy. But I’m obviously not going to do 8:05. T: Compared to Kona, Melbourne is maybe 20 minutes slower. Even an 8:25 would be very close to the front. P: Exactly. So we’ve prepared to go the distance, whatever time it takes. That’s what you’ve got to do. We’ve done the training. If I’m smart, I think I can get a Top 5. If things go my way then, who knows? This is the fittest I’ve ever been. I’m confident, old Crowie just chirping at the back of my head. But the race plan said we know what to do. We’ve got Plan A, Plan B, Plan C. Nutrition’s dialled in, the bike’s dialled in. Everything’s good to go. So I’ve planned as best as I can. We just have to wait and see on the day now. T: Any picture how the race is going to develop? P: I personally think it’s going to be a lot different than last year. I don’t think Andy Potts and Frodo want to get out with Starky and the uber bikers. So I think they’re going to push the swim. I think the swim is going to be very quick. I want to be somewhere sitting on their feet. I feel like I’m doing well and hopefully I can tag along the back. In the first 40k, everyone is sorting themselves out, a lot of surges. So even if we can only get 30 seconds on the group, then we can get clear and stay away for first 20k on the bike, that would be awesome, rather than all that to and fro-ing at the start. I’ll have a little bit of time to settle in. Starky, Marino and Sebi, they’re going to do what they’re going to do and go hard on the bike. I just have to stick to my race plan, get off the bike as fresh as I can and just get to work on the run. I learned a lot from the race in 2012. I thought the race was over, then Andy Raelert rode past me with 30-40k to go and then ran into 2nd. I thought when I start the run so far back, we’re just fighting for 10th or 20th. T: It sounds as if you’re going into the race with a detailed plan of how things are going to work out. You mentioned you’re hoping for something like a Top 5 or so. What do you think is realistic? What would be an over-the-moon result for you? P: If I get a Top 10, I’ll be happy. Top 5, I’ll be extremely happy. Top 3 would be over-the-moon. I think a few things have to go my way and I have to be smart. New guys turn up every year. No one picked Luke to come 2nd last year. Not many people are picking Freddie to win and he just turns up. He’s quiet, turns up, does the job and he came away with the win last year. Frodo could turn up and win. There’s no reason why a new guy can’t turn up and have a real crack. Hopefully it’s me. I feel like I’ve raced it and done Kona like 20 times. With the amount of stories that Crowie has told me over the last 10 months, I feel like a veteran. T: How long will you be in Kona before the race? P: Two and a half weeks. Crowie gets there Monday or Tuesday after the ITU long distance race in Beijing. I get there on Wednesday. We just want to get down from altitude. I’ve been up in Boulder for 3 months now. So I’ll get used to the humidity and the heat, do some rides on Queen K and run the Energy Lab. Then rest up and get ready to go. T: Any picks you’re willing to share? P: I think Freddie will be there about again. He just does his business quietly and he just gets the job done. I think Faris will be there about and I think Kienle will be there. I think Frodo is a dark horse. He could turn up and run at 2:35 or he could blow to smithereens. Who knows? The guy could turn up and win by 10 minutes. On the women’s side, it’s hard to go past Rinnie. I just saw Rachel Joyce running on the treadmill, she looks good. Obviously Caroline Steffen, she’s always there. Working with Macca will be a good change from Sutto. When you’re being with the same guy for so long, it’s good to go to someone else. I think she’ll go well. And Daniela Ryf, the way she’s going, she’s a freak. T: Any sponsors you’d like to give a mention? 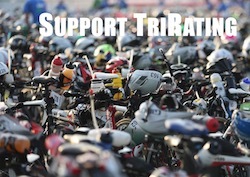 P: I’ve had support from Blue Bicycles, XTerra Wetsuits, Smith Optics, and FuelBelt. They have been good to me this year.